First time on market…our new 1700 sq. ft. luxury waterfront Bellerive home is freshly furnished and fully equipped for a weekend getaway or a month in paradise. Professionally designed and exquisitely decorated with all new furnishings and everything you could want. Fully equipped with 3 brand new Samsung UHD 4K TVs, top of the line Jenn-Air stainless steel appliances, new dishes and full complement of new pots, pans and cookware. Granite countertops in kitchen and both bathrooms, high-speed WiFi (30 MPS), Bluetooth speaker, full laundry room and of course a breathtaking view of the river and amazing sunrises and sunsets from the spacious wrap-around balcony. 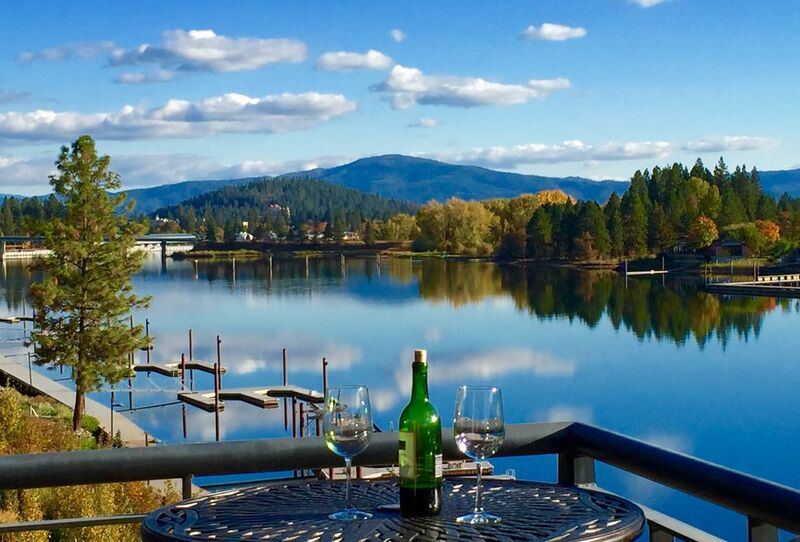 Bellerive is Coeur d’Alene’s most desirable new waterfront community. These distinctive condominiums are located on the Spokane River at the mouth of Lake Coeur d’Alene, one of the world’s most beautiful alpine lakes. The unique location of Bellerive offers everything there is to love about luxury waterfront living. Located on the waterfront of the Riverstone Development, the area features restaurants, spa, entertainment, a 10-acre park, sculpted landscape and a feature lake with a breathtaking 60-foot fountain. *Luxurious 1700+ sq ft waterfront condo right on the riverbank. Luxury, beauty, and comfort surround you. First time on the market with all new furnishings and décor, fully equipped high-end kitchen for cooking great meals or just ordering in. *Huge wrap-around balcony, glorious sunrises and sunsets…enjoy Osprey, Bald Eagles, Canada Geese, and Kingfishers feeding in pristine Spokane river. *Canoe or kayak from the on-site dock into spectacular Lake Coeur d'Alene- among the world's most beautiful alpine lakes. *On-site 50+ mile Idaho Centennial Trail bike path passes 200 feet from your front door and leads to City Park for beach, around the lake, or all the way to Spokane. *Free City Link Bus around town or to COEUR D’ALENE CASINO (18 miles) and Riverstone Trolley to city beach, Coeur D'Alene Resort, or downtown. *Perfect location to warm up for IRON MAN in June, make a big splash In Summer, commute to four area ski resorts in Winter, or just relax with a great local wine any time. *Enjoy spectacular golf courses nearby…CDA Resort floating green featured in Golf Digest, Avondale and Hayden Lake Country Club in Hayden, Circling Raven and Black Rock clubs in Worley, and several great courses in Spokane. Summer: Local Activities *Boating and Water-Sports on Lake Coeur d'Alene. *Golfing at Premier Golf Courses- world famous Coeur D'Alene' Resort GC, Coeur D'Alene' Public GC, Hayden Lake CC, Avondale GC, Highlands GC, and more. Resort Shopping and Dining Downtown and at the Coeur d'Alene Resort. *Art Shows and Street Fairs; Live Music in the Park. *Lake Cruises, City Tours, and Tourist Activities. *Biking on the Centennial Trail and Hiawatha Trail. Fortunate to call CDA home for over 50 years. We love to travel and have lived in London, Singapore, SoCal, Rhode Island, Hawaii, and Virginia but always look forward to coming home to our little piece of North Idaho paradise. On the bank of the Spokane River, at the mouth of Lake CDA. Gas fireplace. Top gets "HOT"- do not place anything on top surface. Secure underground parking...also private surface lot across the street. Private secure underground gated garage. Small fitness room near elevator....treadmill, stationary bicycle, and elliptical machines. Fully equipped kitchen with granite counters, stainless Jenn-Air appliances, all cookware, toaster, coffee maker, mixer, elec skillet...etc. Three new Samsung UHD 4K televisions. Cable internet and DirecTV Choice service, including DVR. Samsung BluRay DVD player with WiFi to access Netflix, YouTube, etc. Small library of popular novels...take one-leave one. Numerous music choices on DirecTV...channels #801 to #866. Large wrap-around balcony overlooks river. Closest course is CDA Public- about 2 miles. CDA Resort with famous floating green is 5 miles away. Several others within 20 miles. Had a wonderful stay. The condo is beautiful, the river front location can not be beat! Enjoyed Alexa playing music for us. Highly recommended for a peaceful relaxing vacation. Pleasant Vacation at a Pleasant Location..
Cleanness and Tidiness are options for everyone to take or break. William with his condo has made to take them. I stayed in his condo in 2017 and returned in 2019 and the same level of cleanness and tidiness persists. The condo has all required appliances and kitchenware to make the stay as easy as if you are home. Moreover, the condo has a beautiful view to Spokane river with a nice walk way right in front. The area is served with lots of restaurants of different verities that meets all tastes. Supermarket and shopping center are in the nearby. In short, it was a pleasant vacation at a pleasant location. Thank you William. Thank you VRBO. Let me preface my review with saying we have rented many vacation homes in and around Coeur d'Alene, including several in the Riverstone and Bellerive complexes. This condo is by far the best vacation home rental in the area. Access was easy and two keys were provided which was convenient. The building has secured entrance including the underground parking garage for an added layer of safety. The location is convenient to shopping, downtown and freeways. The condo was well furnished. The appliances are awesome. There was a top notch Keurig coffee machine, a Nest thermostat for easy temperature control, and a Amazon Echo for continuous music and such. The beds were comfortable and there were plenty of blankets and pillows. Both bedrooms have windows, which isn't the case for all the 2 bedrooms in this complex, some units have no window in the 2nd bedroom which makes it feel claustrophobic, so that is a big plus in my book. The furnishings and finishes throughout the home are luxuriously tasteful. Last but not least can we talk about that view. As I mentioned before we have rented in this complex several times and we are no stranger to the gorgeous view of the Spokane River. With that said, it never ceases to take my breath away, and the view from the wrap around balcony is exceptional. As we sat in the living room admiring the view a majestic American Eagle flew by to give us a show. This is a must stay place, and we will definately be back. Thank you Jessica for the nice review. That’s exactly how we feel about our condo and are excited about living there when we retire. So glad you got to enjoy our eagles...they are spectacular. We had a very pleasant stay. The condo was beautifully furnished & very comfortable. We absolutely loved our stay in this unit! The condo is centrally located with a number of restaurants within walking distance. The unit is incredibly clean, well-organized, and spacious. The view is undeniably gorgeous. We found the added extras of things like laundry detergent, dryer sheets, and coffee pods to be a really nice touch to make our stay all the more comfortable. We definitely plan to stay here again. Spiffy, modern condo on the Spokane River. Spacious kitchen, comfy beds and great deck and views. We enjoyed a glass of wine on the deck in the evening and having Alexa play our favorite music. We liked walking along the Centenial Trail right outside the door. We also walked to shops and great restaurants and wine bars. Terrific location. Would love to stay here again in the summer. No pets, no smokers, no parties. Max 4 guests in 2 beds. 4 PM Check-in. 11 AM Check-out.